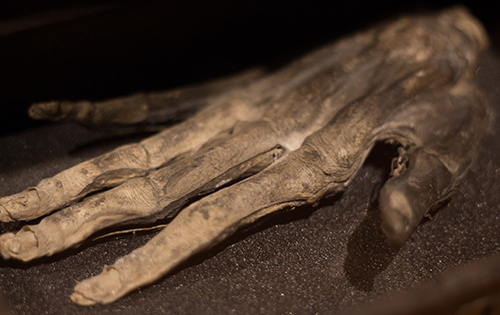 Did the Hand of Glory really work or is it just a folk tale? The Hand of Glory is a peculiar artefact. It appears in the folktales of northern England, and examples even exist in museums around the country. But this is a strange one for this blog because Hands of Glory weren’t simply a folk tale. They really did exist. Question is, how true were the stories about their potency? You can listen to this post using the player below, or keep reading! 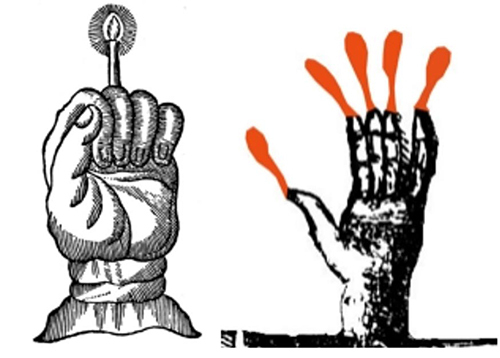 So what is a Hand of Glory? Put simply, you made a Hand of Glory by drying and pickling the hand of a man who’d been hanged. In some stories, the Hand acted as a candle holder. The candle would be made from the fat of the dead man, with his hair used as the wick. More commonly, the fingers themselves were used as wicks. Yep. You’d never see them make one of those on Blue Peter. The different uses for a Hand. Not just anyone would particularly want to make one. But thieves would. Again, details vary between stories, but most commonly, the Hand might ensure everyone in the house stayed asleep during a robbery. Some believed the Hand made its owner invisible, while others thought it gave the power to open any locks. The use of the fingers as candles is important – each finger represented a person inside the house. They would not be able to wake until their flame went out. Humour me. How would you make one? Start by removing the right hand from the corpse of a murderer on the gallows. (Note: Some believe the left hand was the ‘sinister’ hand and therefore more powerful). Don’t just do it at any time – make sure you remove it at the dead of night. During a lunar eclipse is even better. A Hand of Glory. Image courtesy of Colin Wilson. Drain the hand of blood, and position its fingers – you’ll need to do this before pickling it. Now wrap the hand in a cloth and pickle it for a fortnight in a solution of saltpetre, long pepper and salt. After two weeks, leave it to dry for several months. If you want to turn the fingers into candles, this is the point when you dip them into wax. If someone made one, how could I protect my home? Make a concoction of “the gall of a black cat, the fat of a white hen and the blood of a screech owl” (The Line-up). Smear it on your doorstep and window ledges. Alternatively, try and extinguish the candle with sterilised milk. One story, retold by Sabine Baring-Gould in Curious Myths of the Middle Ages (1873), tells of an inn in Northumberland who took in a beggar late one evening. Soaked with rain and chilled to the bone, the beggar asked for lodgings for the night. The inn had no spare beds, but the beggar was happy to lie on the mat in front of the kitchen fire. Everyone except a servant went to bed as normal, though she was somewhat shocked to watch the beggar produce a withered human hand. When he lit the fingers, she realised what he was about to do. The beggar became too engrossed in his thievery to notice one of the fingers had not lit (since the servant was still awake). She tried rousing the men of the house, but the enchantment of the Hand kept them firmly asleep. While the beggar toured the house, dumping the valuables into a sack, the servant tried to put the Hand out. Blowing on the flames, and pouring beer on them, did nothing. As a last resort, she threw milk over the Hand, extinguishing the flames. She locked the beggar in the room he was robbing, and rouse the household. Similar stories also exist in Yorkshire, such as Spital Inn on Stainmore. Well, the Hands definitely exist. Whether they work or not is open to personal belief. The stories are most common in the north of England. A common accusation during the 16th and 17th-century witch hunts was that they were making Hands of Glory. One such Hand was found in the wall of a cottage in Whitby. Donated to the Whitby Museum in 1935, some believe it’s the only Hand to actually survive. Experts believe it may have been used as late as 1820! I’ve got a tiny bit of an issue with this. People find plenty of strange artefacts stowed under floors, inside walls, or up chimneys. Much like witch bottles in the garden (or attic). Who’s to say this specimen wasn’t just a protective talisman and not a Hand of Glory? In some of the research I encountered, researchers described the Hand of Glory as a mistranslation. When “mandragora”, or mandrake root, appear in French, it became main de gloire, or Hand of Glory. It’s an interesting point, but given the physical existence of Hands, it seems likely that someone actually went to the trouble of making one. Quite how the recipe evolved, and why anyone thought to make one in the first place, remains a mystery. Did people actually believe they worked? Many possibly didn’t, but at the time, people fervently believed in the power of human remains. The remains of criminals were especially powerful. Many believed their life of crime added extra potency to the Hands. I’ve read stories of people dipping handkerchiefs in blood dripping on the scaffold. And look at the stories surrounding the powers of religious relics, which are essentially just body parts. The Hand of Glory tales on record all bear the hallmarks of urban legends. The teller was told the story by another, who had often heard it from yet another individual. Rarely did the stories include actual witnesses to give any personal testimony. So while the Hands do physically exist, there’s little evidence to support the ways in which they were used. And there’s certainly no way to prove they work – short of making one yourself! Do you think the Hand of Glory worked? Or is it just a weird souvenir of a bygone age? Let me know below! If you enjoyed this post, then sign up for new post updates below. 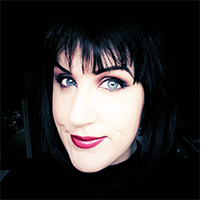 You’ll also get my recommendations for five awesome folklore podcasts you can follow! This was so interesting, not least because I’d never heard of Hands of Glory before. I loved the story, too — I’ve met so many people who are so comfy with their fake things that their minds can’t accept when something is authentic. I love handmade things and IKEA, though (and making handmade things from IKEA things). Just another reason why I couldn’t shop with someone like Nikki. I first came across them among local folk tales when I was little and I always thought they were fascinating. I’m just waiting for one to turn up on Bargain Hunt! I loved this! Well-written and really interesting. Thanks so much for sharing such a fascinating bit of fokelore plus a great complimentary story. I hadn’t heard of Hands of Glory either, Katherine. It’s fascinating and a little gruesome to think that they really did exist. Isn’t it? You have to wonder why someone thought “I’m going to make one of those”. Yes, for sure. It’s not something I’d ever want to make. I remember reading about the Hand of Glory when I was a little kid in a book of Northumbrian folk tales (God that explains so much about me). I just love the macabre and bizarre side of human nature!